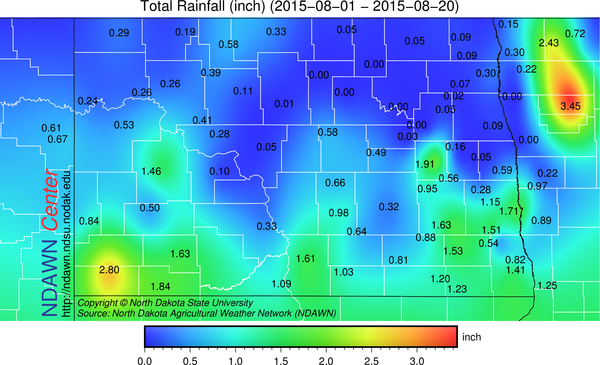 A weak disturbance did bring some rainfall into northeastern North Dakota into northwestern Minnesota earlier this morning. 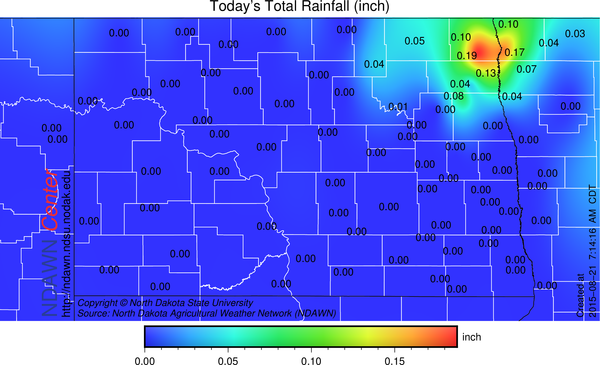 Even with that light rain over night, there are still several NDAWN stations with no measurable rainfall this month and several more under one-third of an inch. It appears that will change this weekend as an area of low pressure with a corresponding cold front will bring an enhanced risk of rainfall this weekend, mainly on Saturday and Saturday Night. Low pressure is currently situated in eastern Montana with a warm front through southern North Dakota into South Dakota. That front will surge north today bringing with it much warmer conditions to most of North Dakota. Maximums today are expected to be in the 80s with a few locations perhaps near 90° or a touch warmer. One factor today that may limit the maximum temperature will be the smoke in the air. The sky looks like it will not be blue today, even with an overall clear sky because of the smoke in the air which will probably lower the maximum temperature potential in the area today. Even with the smoke, the maximums in the 80s are expected with a stiff south wind at 15-25 mph across much of the region. It is tomorrow that the rain threat begins as well as a transition back to cooler temperatures. The graphic below is an estimated surface map for 1:00 PM Saturday. By that time a cold front is already expected to be approaching the Red River Valley meaning most of North Dakota will already be in the cool sector of the storm. Some portions of western North Dakota will likely record afternoon temperatures only in the 60s, whereas, the southern Red River Valley may be as warm as the lower 80s before the front moves through and begins to lower the air temperature. Behind the cold front tomorrow the wind will be particularly strong in western and some parts of central North Dakota where some locations are in a High Wind Watch. All areas will see a stiff west or northwest wind develop on Saturday, but southwestern North Dakota will get it the worst. Some “wraparound” rain will circulate around the low especially Saturday Night into early Sunday. This will mean two threats of rain tomorrow, first associated with the thunderstorms along the cold front and the other will be the “wraparound” rain Saturday Night. Beyond the weekend, continued cool on Monday (maximums on the lower half of the 70s), then a slow warm up through the week. A ridge of high pressure in the upper-levels of the atmosphere is expected to develop meaning back to above average temperatures by the end of next week. 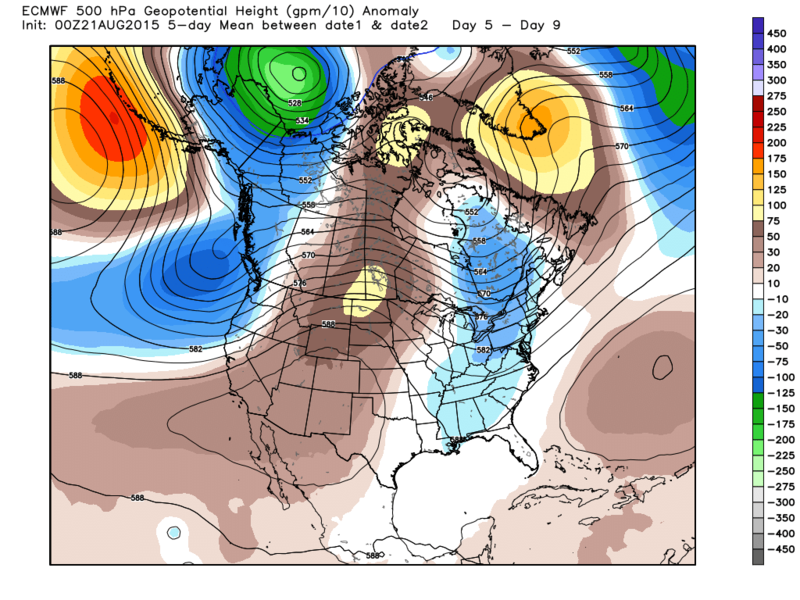 Another cool down is expected late August into the first of September time frame, than another ridge developing for the first 10 days of September looks to be the over all pattern for the next 3 weeks at this time.